The Group Replication advisors, Group Replication Configuration and Group Replication Status, provide continuous analysis of the condition of your group replication topologies. 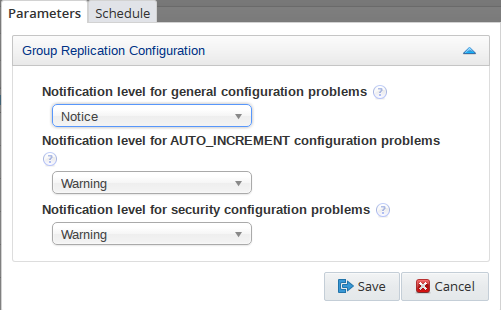 The configuration advisor analyzes the configuration of the servers, checking for misconfiguration which could lead to unstable or insecure installations, and the status advisor continuously monitors for servers which go offline, or fall out of sync with the other members of the group. The Group Replication Configuration advisor checks the configuration of the monitored group topology and raises events if any of the group members are incorrectly or insecurely configured. group_replication_bootstrap_group: generates an alert if variable set to ON. group_replication_force_members: generates an alert if variable is not empty. group_replication_allow_local_disjoint_gtids_join: generates an alert if variable set to ON. group_replication_enforce_update_everywhere_checks: generates an alert if variable set to OFF. group_replication_single_primary_mode: generates an alert if variable set to OFF. auto_increment_increment is greater than, or equal to, the number of nodes. group_replication_ssl_mode: generates an alert if variable set to OFF. The Group Replication Status advisor checks the monitored topologies for errors, loss of quorum, fault tolerance, and network partitioning. For more information, see Group Replication. Notification level when discovering a Group Replication member with a state of ERROR: select the required level for events if a group member's Member_state is ERROR. For more information, see The replication_group_members Table. 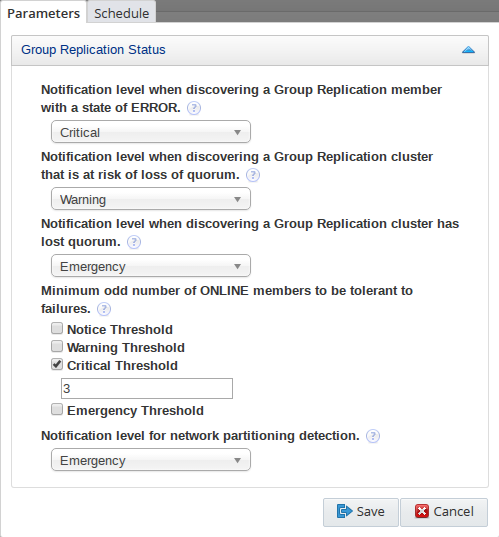 Notification level when discovering a Group Replication that is at risk of loss of quorum: notification level if the monitored topology is found to have an even number of members. Notification level when discovering a Group Replication has lost quorum: notification level if more than half of the monitored topology's members are offline. Minimum odd number of ONLINE members to be tolerant to failures: notification level if the number of online members of the monitored topology falls beneath the defined number. Notification level for network partitioning detection: notification level if one or more members of the topology are online but unreachable by other members.